Dolly is one of our best mothers. She has great body capacity and good udder attachments. 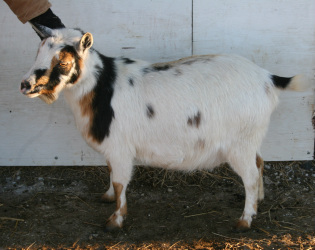 Dolly had large triplets in March and we lost a buck but the other kids are looking great. We are retaining the doe (Tenocity). Dolly's udder bloomed. I would have never expected to see it so large. Guess she is a late bloomer.